Last semester, I joked that I’d somehow gotten ahold of a virtual Time-Turner, since I was taking a class at USC that occurred at the same time I was teaching at Cal State LA, on Thursday evenings. This was possible since I was taking the class through the Distance Education Network, and therefore could view the 2.5-hour lecture on my computer at a later date (usually the weekend). 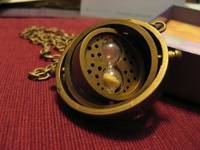 Santa sometimes has a funny sense of humor, and this Christmas he brought me (among many other wonderful things) an actual Time-Turner. And yet — while it was pretty cool to be able to turn time last semester, unlike Hermione I didn’t actually end up with any more hours in the week. By the end of the term, I was aching for a break. So I held my Time-Turner and realized that, rather than a symbol of incentive for double-booking, really it was more of a warning — a caution against that kind of stacked-up crazy schedule. But did I heed the warning of the Time-Turner? No. By the time January rolled around, I’d already committed to an even crazier term: working, teaching an entirely new class at Cal State LA, taking yet another class at USC, all the while trying to write a Master’s thesis so I can graduate this spring. None of them are technically overlapping in time, but (just as when the Time-Turner let me spread things out) all together it’s still a gradually suffocating weight. Thank goodness my teaching duties end with the winter quarter at Cal State LA. As of March 15, I’ll have one less thing to occupy my energies. And if I ever propose this sort of schedule again in the future, someone kindly strangle me with the Time-Turner’s chain. You and Hermione both seem to be able to handle dramatically busy academic schedules, even without the use of a Time-Turner. Strangulation seems excessive unless you start committing yourself to more than 28 hours of stuff a day! Never underestimate the power of learndorphins. On Venus you’d get another 166,680 minutes per day. But a year would be a little under two days long. On Mars, however, not only would you get an extra 39 minutes per day, you’d also get 668.6 days per year. 18-week quarters, anyone?